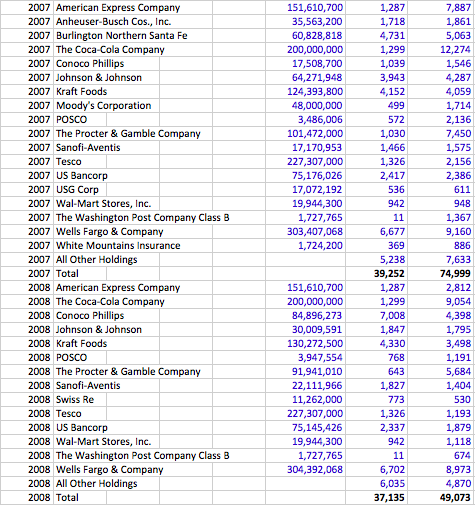 See public equity investment list I've compiled below from 1977-2012 Berkshire Hathaway shareholder letters. I have a list of buyouts and private investments, as well. Another set of data. Source: Berkshire Hathaway annual shareholder letters, 1977-2012. Berkshire's reporting of its positions in this format starts in 1977 because it is the most apples-to-apples format on a GAAP basis compared to now. I will be updating the data to go further back to include pre-1977 investments as well as private acquisitions and post-2012 updates. Note: I believe the $ units in the list above are in $000s each year until they change at one point, and I need to scrub my numbers to confirm; I think the $ units may have changed during the mid-80's. Regardless, this at least accurately reports the companies underlying the public stock investments.